“Hyfrydol”, meaning “cheerful” in Welsh, was composed by Rowland Huw Prichard when he was 19 years old, and published 14 years later, in 1844, in the composer's handbook to the Lutheran Hymnal Cyfaill y Cantorion (“The Singers' Friend”). 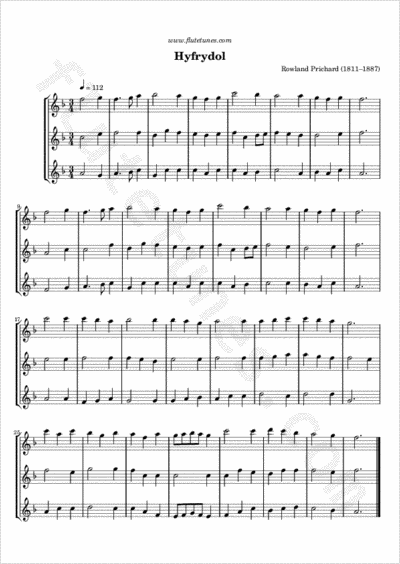 This popular, singable hymn tune features the vocal range of only a sixth, from F to C, and appears in a number of Christian hymnals in various arrangements, the best-known probably being that by Ralph Vaughan Williams. Hyfrydol has been used as a setting for William Chatterton Dix's hymn “Alleluia! Sing to Jesus!”, Charles Wesley's “Love Divine, All Loves Excelling”, “I Will Sing the Wondrous Story”, and “Come Thou Long-Expected Jesus”, as well as many other hymns from a variety of faith traditions.